Hi foodies..Welcome to AYESHA'S KITCHEN. Kerala cuisine is well known for spicy and flavorful seafood delicacies / Fish recipes. A spicy flavorful fish curry or gravy served with hot rice is a must for lunch among some keralites. Here am sharing a fish masala with Varal / bral fish where fish is marinated, grilled in pan using less olive oil and tossed in a spicy gravy. Fish is a rich source of omega 3 fatty acids, but fried fish is unhealthy when compared to baked or broiled..Pan fried fish is better than deep fried, and the use of olive oil for sauteing or frying makes the difference. Varal fish is very rich in albumin, a type of protein which is very essential in the healing process of wounds. So it is better to bake the varal fish or grill or cook with marinade ( vattichath in malayalam). 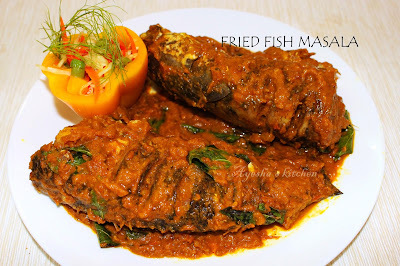 Here is the recipe of pan fried fish masala gravy. Clean and make slits all over the fish ( this fish also called as kannan fish among malayalees) and cut into halves. Now make a marinade with pepper powder, soy sauce, ginger garlic paste, vinegar and salt. Marinate the fish well and let the marinade to pass into the slits, set them aside for 10 minutes. Then heat olive oil in a pan and fry both sides of the fish in a medium heat until the fish is well cooked. Once done keep it aside. Mean while prepare the masala / gravy. Make a ground paste of tomato, ginger garlic, coriander powder, turmeric powder, chili powder and salt using a grinder. Now add it to a vessel and cook it without adding water for 8 minutes in a medium flame. Stir occasionally. Heat a pan with 2 tbsp oil and saute the finely chopped shallots, add curry leaves, coriander leaves chopped and pour it over the masala gravy. Now mix well and cook until the oil separates. You can now add few tbsp of water if required. Check for salt. When done add the fried fish and mix gently. Toss the fish well in the gravy in a low flame until the fish is completely coated with the gravy. Once done, transfer to a serving dish and serve hot with hot rice. Delicious!!!! !